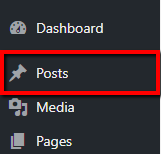 If you need to change the category of a post, navigate to “Posts”. You can change the category within the post editor (from the “Categories” box), but you can also change categories quickly using the “Quick Edit” option that appears when you hover over your desired post from the list. Using the categories checkboxes, tick and un-tick categories as desired. Then click “Update”. You post’s categories have now been changed.